Sara (Caity Lotz) and Amaya (Maisie Richardson-Sellers) in matching black leather outfits are chasing another woman who is also dressed in black and wearing a mask. She uses some T-Spheres against them. It doesn’t help because they catch her and double-team her in the fight. This masked woman is Felicity Smoak (Emily Bett Rickards). She is a masked vigilante, one of the few left in Star City. Sara and Amaya take her to their boss, Mayor Damien Darhk (Neal McDonough). Damien has a collection of the superhero masks he has collected. We see the Green Arrow’s mask, the Flash’s mask along with other masks from the Arrowverse. Felicity tells him she’ll never stop fighting for her city. Sara snaps her neck. In Central City at Star Labs, Malcolm (John Barrowman) and Eobard Thawne (Matt Letscher) are meeting. Thawne has the Black Flash locked in a cell to view for his amusement. Malcolm wants to borrow the Spear of Destiny from Thawne to change a few things in realty. Thawne won’t let him have it. He tells Malcolm he should be happy, he has his wife and son back, and Thea adores him. Malcolm can even clap now. 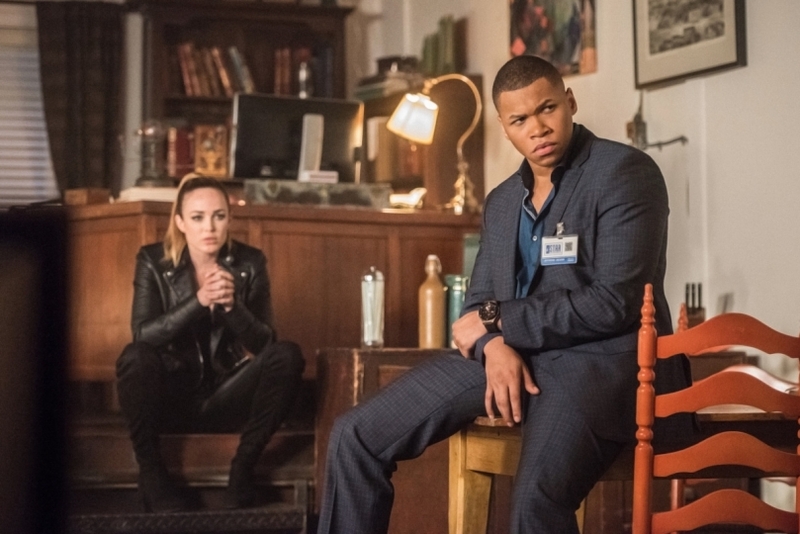 Jax (Franz Drameh) interrupts their meeting, he is there to talk about the project Thawne has him and Martin (Victor Garber) working on. Damien is upset that Thawne didn’t wipe the Legends out of existence. Thawne and Damien have kept them around because it amuses them to have the Legends under their control. Mick (Dominic Purcell) and Snart (Wentworth Miller) are robbing a bank. The police arrive but when they realize who they are, they let them go with an apology. Mick doesn’t like this, what’s the challenge in being a criminal if no one can touch you. Thawne summons them; Mick doesn’t like it. They get rid of one speedster to be under another one. Rip (Arthur Darvill) is aboard the Waverider baking cakes. Gideon is his only companion. The Waverider has very little power and can’t do anything. Unlike the other Legends, Rip still has his memories. Gideon wants to send out a distress signal, but Rip thinks that is hopeless. Jax is Martin’s supervisor and he rides him hard. The project they are working on is a reactor. Jax is pressing Martin to work faster and finish the project. He clears Martin’s desk and orders someone to clean up the mess. Ray (Brandon Routh) is the janitor. Thawne wants Mick and Snart to keep an eye on Malcolm. Mick doesn’t want to be Thawne’s spy. Security brings in Nate (Nick Zano). He is a wild-eyed conspiracy nut who came to talk to Thawne. Nate knows that reality has changed. Since Thawne is the smartest man on Earth, he thinks Thawne can fix it. Thawne orders Mick and Snart to take Nate out and kill him. They take Nate out into the woods to kill him. Nate is babbling that he writes a blog no one pays attention to. Snart is ready to kill him but Mick is hesitant. He doesn’t like the way things have turned out. Mick doesn’t like working for Thawne and he and Snart don’t have a real partnership. Snart patronizes Mick again and Mick knocks him out. Nate is confused with what is happening but realizes Mick is saving him. He asks why, Mick responds he has made a mistake. Back on the road Mick starts filling Nate in on what is happening. They drive to Star City to Ray’s apartment. Even though he is a janitor in this reality, he is still a genius. He also senses the change in reality so he built a gun that can restore memories. Mick shoots Nate with it; Mick regains his memories and remembers Mick betrayed the Legends and hits him. Snart reports to Malcolm and Damien what Mick did. Malcolm starts the “told you so(s)” about keeping the Legends around. Damien sends Sara and Amaya after Mick. Snart planted a GPS on him. Back at Ray’s apartment, Mick shoots Ray with the memory gun; he regains his memory and hits Mick. Sara and Amaya show up. Ray and Nate try to get them to remember them. Nate tries to show his powers but Mick informs them the change in realty also took their powers. Ray tells Sara and Amaya they are heroes, Sara smiles and tells them they kill heroes. A fight begins, they shoot Sara and Amaya escapes. Sara remembers and hits Mick. Mick tells them the next person who hits him he is hitting back. Rip is drinking rum and feeling sorry for himself. Gideon tells Rip to start acting like a captain. Rip doesn’t think he can. Gideon gives him a big motivation speech and inspires Rip to be Captain Rip Hunter again. While he was baking, Gideon had been working out a way to gather all of the ship’s auxiliary power so they can send out a distress signal. They shoot Jax with the memory gun at the Star Labs parking lot. Jax informs the group that he and Martin were building a reactor for Thawne. They figure out Thawne is building the reactor to destroy the Spear of Destiny to make this reality permanent. The new plan is to steal the Spear of Destiny from Thawne and have Amaya use it to bring back the previous reality. Thawne threatens Martin to get the reactor operational. Martin does, now he has to monitor the core until it is hot enough to destroy the Spear of Destiny. Sara tells Mick he can’t go with them because they can’t trust him. (So instead of knocking him out, locking him up, tying him up, they just leave him in the basement to sit obediently while they are gone. What could go wrong?) Mick goes straight back to Snart to tell him the Legends plan. The Legion of Doom decides to steal the spear for themselves while the Legends and Thawne are fighting. Jax goes into Star Labs to shoot Martin with the memory gun. Martin thinks Jax is trying to kill him. He knocks the gun out of Jax’s hand breaking the gun and he presses the silent alarm. Before the Legends can get the spear, the Reverse-Flash appears. Before he can throw the spear in the reactor, the rest of the Legion shows up. A big fight breaks out between all the groups. Mick ends up with the spear again. Snart tries to talk him into giving it to him again. 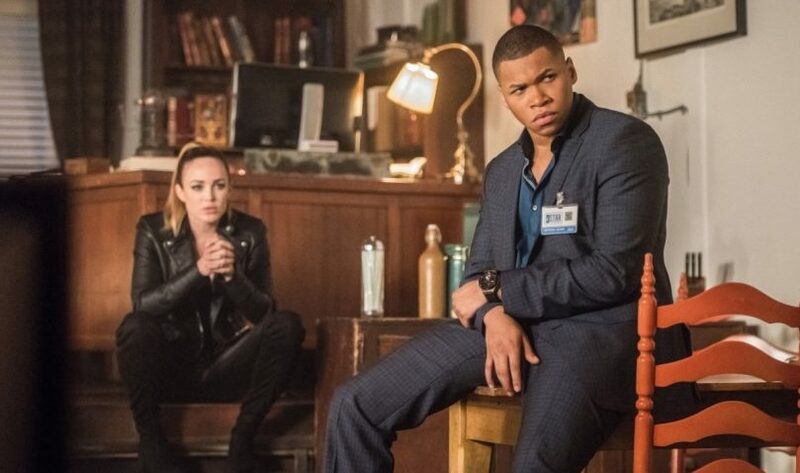 This time Mick doesn’t fall for it, Snart has been talking down to him and treating him like a dog, and he won’t be anyone’s dog again. He slides the spear over to Amaya. She begins reciting words to gain control of the spear. Suddenly Snart shoots her with his freeze gun. Amaya is a block of ice and Snart pushes her, smashing Amaya into a million pieces. The Legends are in shock. Thawne uses this time to get the spear back, tosses it into the reactor, and destroys it. He won’t kill any of them. They will suffer more knowing they weren’t able to stop him and being the only ones to know that reality has changed. The Legends are back in Nate mom’s basement, they have failed completely. They lost Amaya and weren’t able to restore Martin’s memories. Sara decides they have to go back to 1916 and destroy the spear this time. There is the danger of them interfering in a time they have already interfered with before, but Sara is willing to take the chance. There is one more obstacle, they don’t know if the Waverider even exists now. Rip is able to broadcast a distress signal. The Waverider is the size of a model spaceship. We are in the new reality the Legion of Doom created and to be honest, it didn’t look any worse than the one we are in now. Trump is even President, which lets you know it is the darkest timeline of all. If you aren’t a Legend, your life is probably not that much different than it was in the old reality. I remember when the Star Trek franchises would do the mirror universe episodes. Our heroes always met their evil counterparts. I especially enjoyed these episodes on “Deep Space 9”. “Enterprise” had a two-part mirror episode at the end of the series that were the two best episodes of the show. I was hoping this episode would be special like those episodes were. They didn’t spend enough time with the Legends before they got their memories back to explore who they had become. We know Ray was a janitor, Amaya and Sara were henchwomen for Damien Darhk; Nate was a conspiracy theorist; Martin and Jax worked for Thawne, but not much more than that. They could have used an entire episode of the Legends in their new lives before they got their memories back. This felt like a lost opportunity. The episode was fine and enjoyable, but I was expecting memorable.